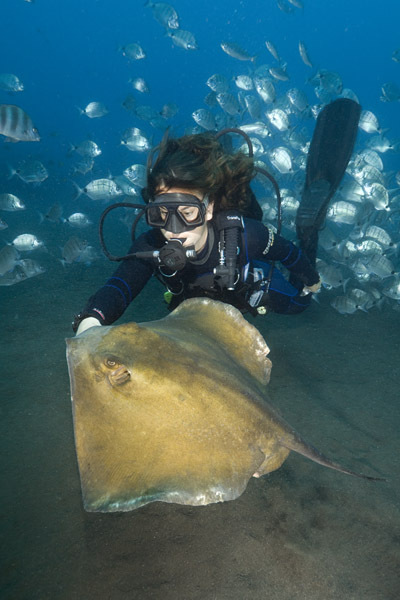 Diving with Common Stingrays and Common Eagle Rays at Los Gigantes, Tenerife, Canary Islands. Encounter: Where to start! The ray feed at Los Gigantes attracts many Common Stingrays (Dasyatis pastinaca) and Common Eagle Rays (Myliobatis aquila). A few enormous Roughtail Stingrays (Dasyatis centroura) are also regular participants and many other ray species can make an appearance. Occasional visitors include round stingrays (Dasyatis grabata) and Common Angel Sharks (Squatina squatina). Marbled Torpedo Rays (Torpedo marmorata) and Spiny Butterfly Rays (Gymnura altavela) are also found in the area. 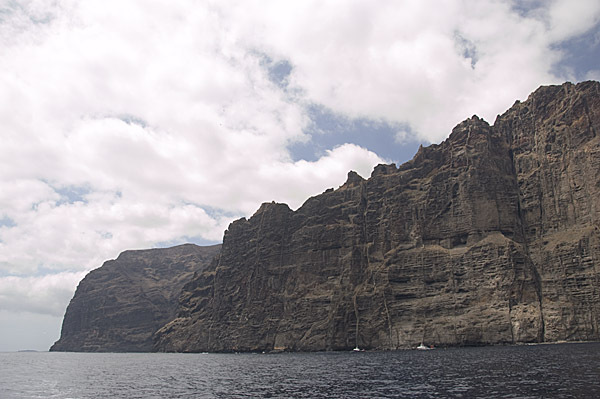 The feed takes place once or twice a week in 60ft of water in the shadow of the enormous Los Gigantes cliffs. A dive master takes down a full barrel of fish scraps and is marauded by the closest rays. More rays arrive as the scent spreads. Many of the animals are regular visitors that are very used to human contact. 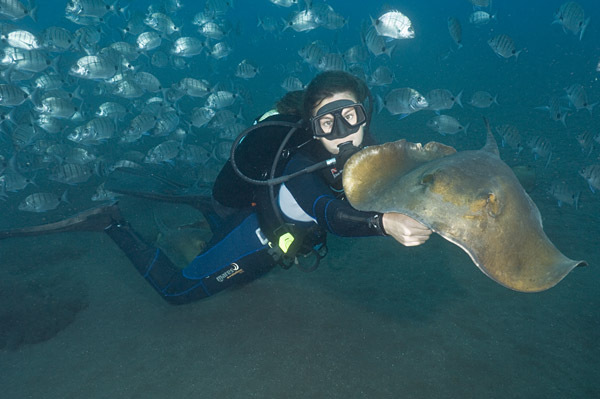 These rays can be handfed by any divers wishing to grab a handful of fish and join in the fun. Photographic opportunities abound but as the feed continues, the circling of the rays close to the sand and the kicking of the divers drives visibility down. The sand is heavy and quickly settles but the activity during the feed keeps the area in a perpetual fog. Operators: The English speaking Los Gigantes Dive Centre located in the harbour of the small town of Los Gigantes is the only operator that organizes feeds. The owner / manager Neville has been working with the rays since 1996. He takes a responsible attitude towards the interaction to ensure the welfare of the rays and divers alike. Accommodation: There are a number of nice hotels in Los Gigantes but the most convenient option is adjacent to the dive shop. Neville can arrange accommodation for divers wishing to dedicate a few days to diving the spectacular sites in the area. Directions: Los Gigantes is on the west coast of Tenerife. it is a two hour bus ride from the capital. Divers should be aware that the journey from the city involves a climb to a high altitude which should not be attempted after diving.